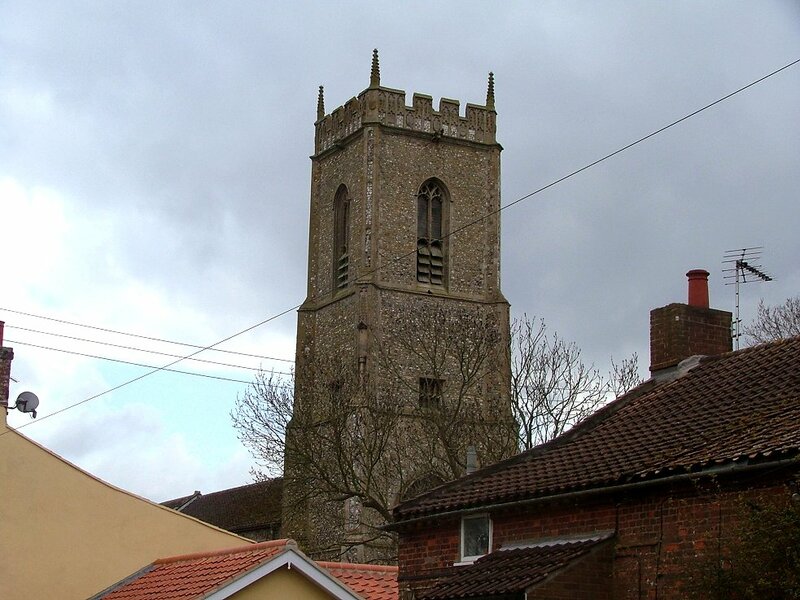 The giant Norfolk Perpendicular church with a remote village around it is a bit of a cliche - and yet, here it is. 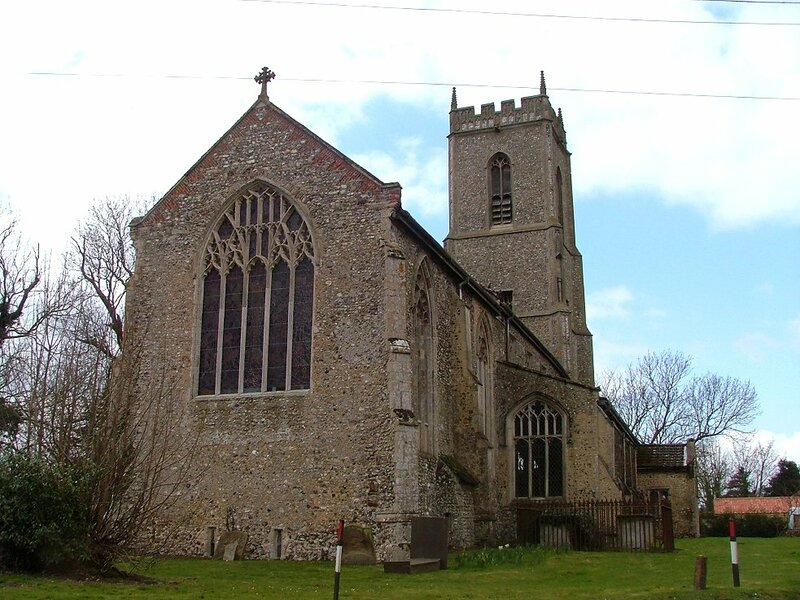 St Bartholomew is vast, and Brisley is remote, in the winding lanes between Dereham and Fakenham. The church utterly dominates the place, and it is hard to stand somewhere and not either see it or be aware of its presence. Think of what that must have been like in the late middle ages! 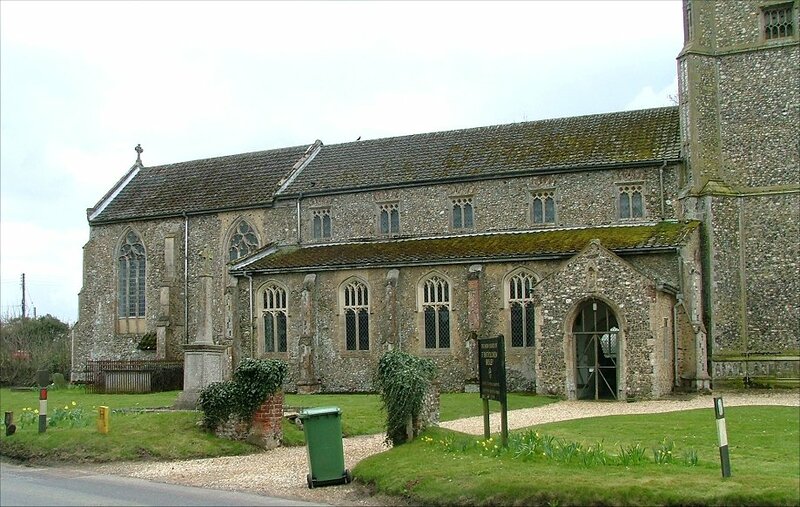 We often talk about the hugeness of these churches as being an offering to the glory of God, but it the sheer presence of a place like St Bartholomew doesn't half concentrate the mind on the spiritual side of life. It must have been both a comfort and a terrifying reminder of last things, and the world to come. 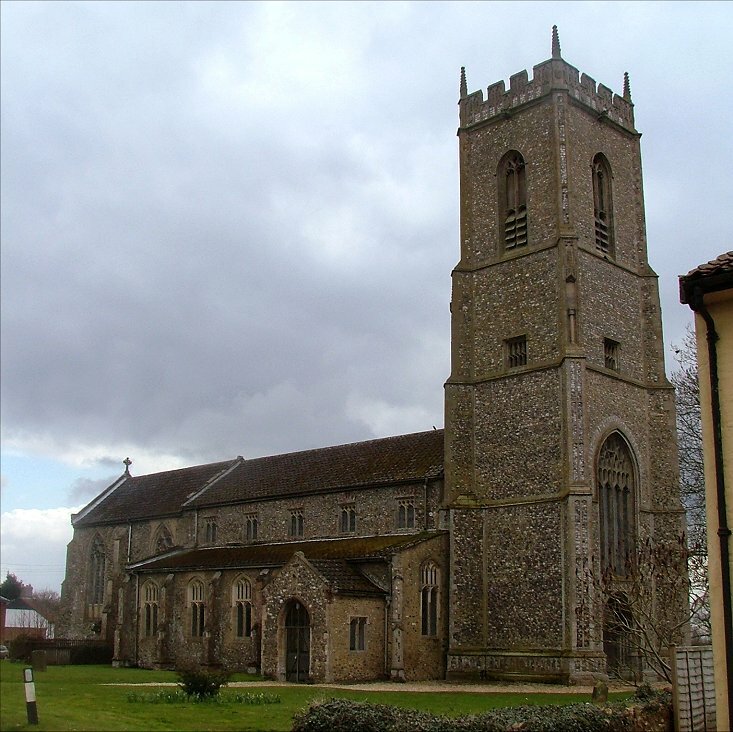 Brisley is a fairly sizeable place, or relatively so in this remote area of narrow lanes and straggling hamlets. There was something about it that made it seem more urban than it was, and it took me a moment to put my finger on it. Then I noticed the telegraph wires - they line the graveyard, cutting across each other as they connect to the houses on the other side of the road. It isn't terribly attractive. Ironically, of course, we are gradually doing away with such things in town, replacing them with radio links and underground fibre-optic cables. 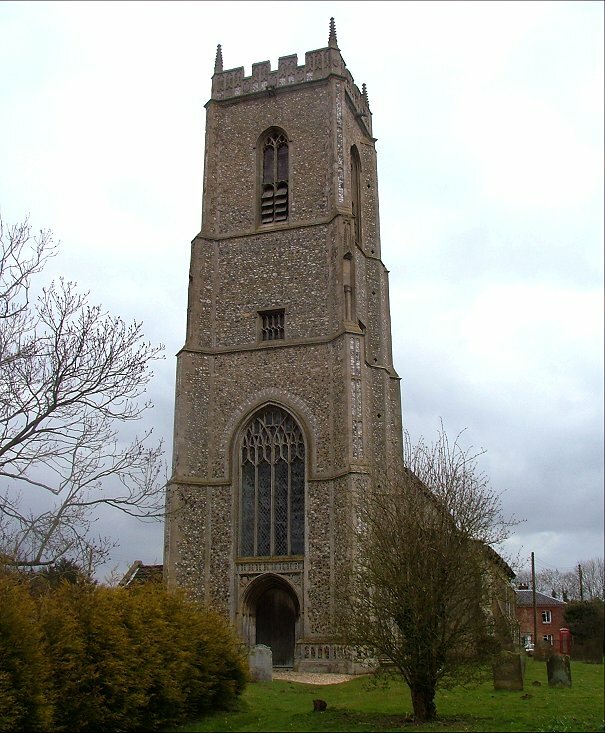 But here in the heart of rural Norfolk such things still create a kind of visual pollution. It took some creative use of Paintshop Pro to remove them from the image at the top of the page. The hugeness of St Bartholomew is accentuated by the sheer bulk of the tower, and also by the way that the four stages work together. The lowest stage is the biggest, and the enormous west window is set within a kind of blank arch. 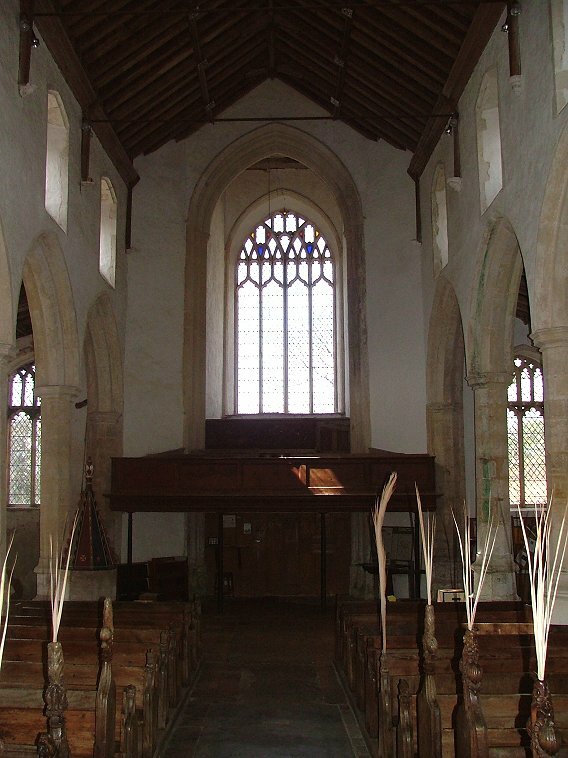 The aisles squeeze the nave up into a clerestory to the east of the tower, with a large chancel on its own beyond. 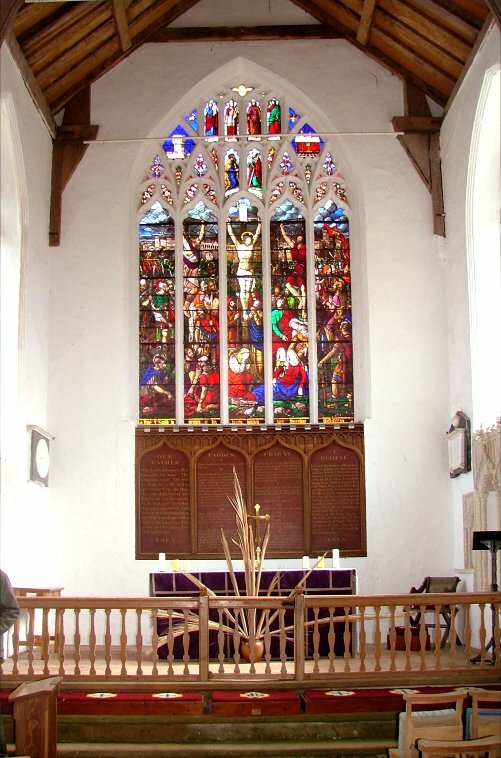 The tall chancel windows create a sense of the building pushing back against the tower, a delightful tension. 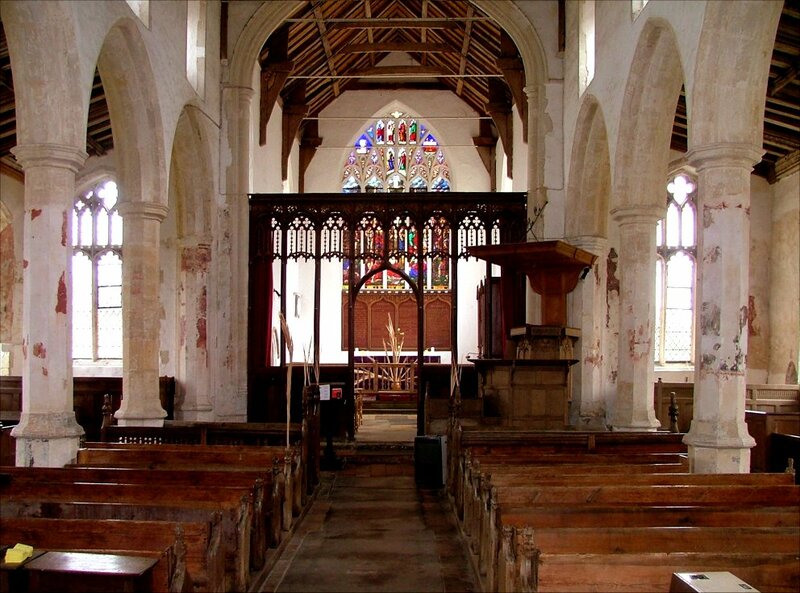 Some of these great 15th century churches were over-restored in the 19th century, turning them into urban, anonyomous spaces inside that might as well be in the centre of a busy town. 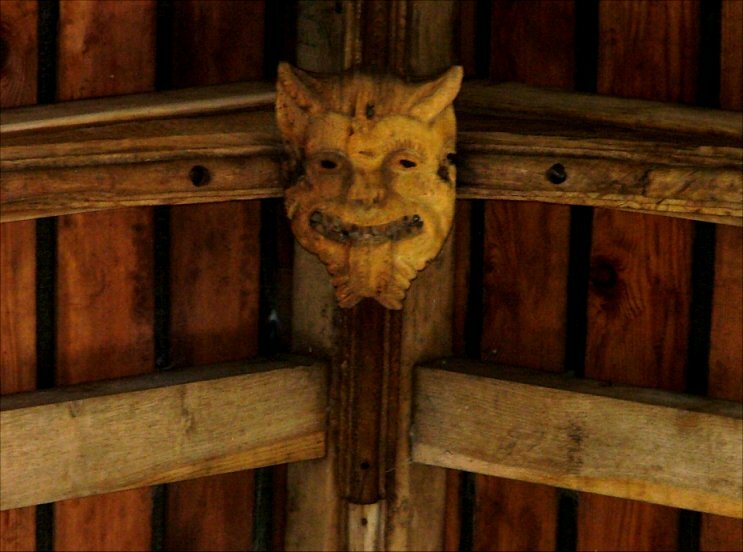 But St Bartholomew was not one of them, and to enter it today is to find yourself in an utterly rustic, even ramshackle place. 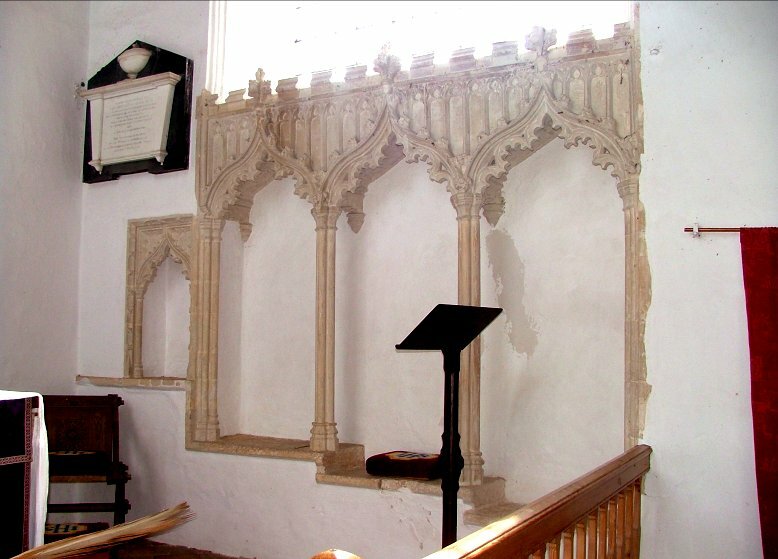 It is very atmospheric, a delight if you, like me, enjoy rough and ready churches. The ranges of old benches with their traceried backs line the stone floors under old roofs with head bosses, and the walls around are speckled and dappled with flaking patches and hints of colour. 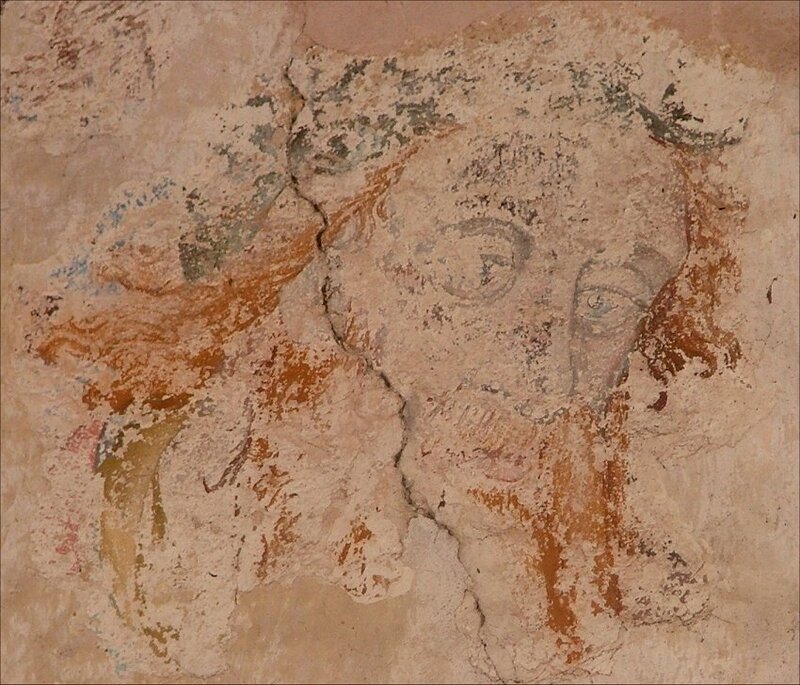 There are some wall paintings remaining, including the haunting face of one St Christopher, the stooped body of a second and the unusual survival of St Andrew carrying his cross. 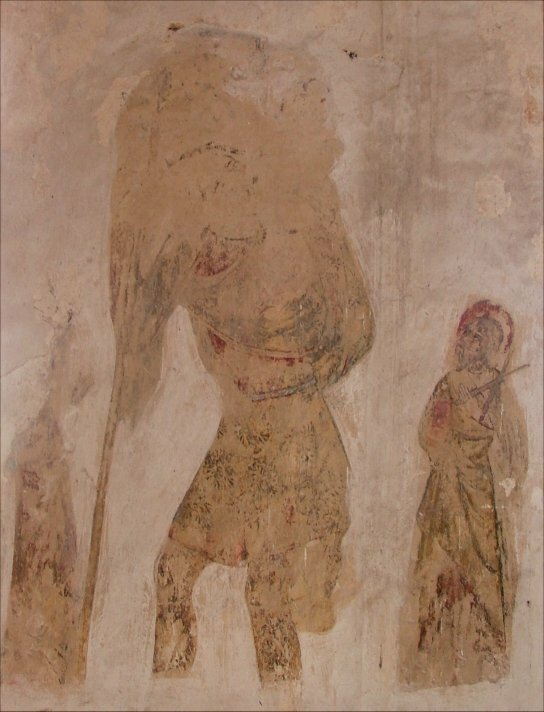 A third figure is claimed as St Bartholomew; well, I couldn't really say, but there is a fine angel in a window splay in the north aisle which obviously once formed the back of an image niche. Brisley is a church of idiosyncracies, of a hundred little details that make the place unique. 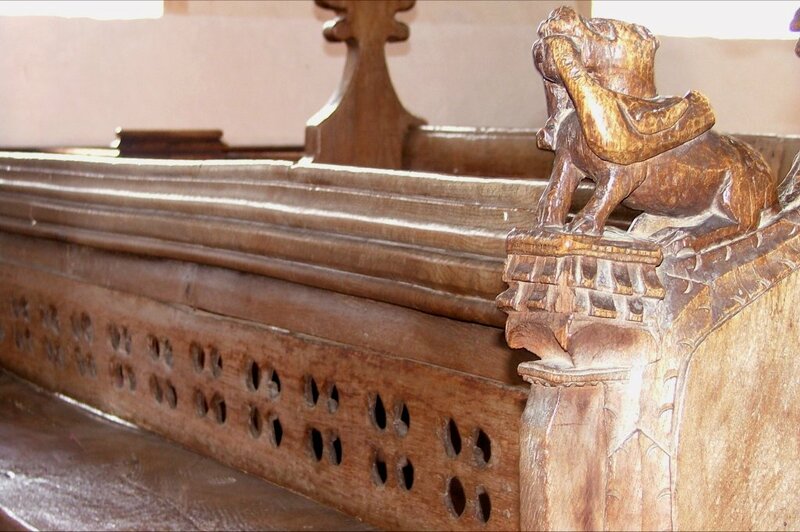 There are a number of carved 15th century bench ends, including an engaging dog with a goose in its mouth. 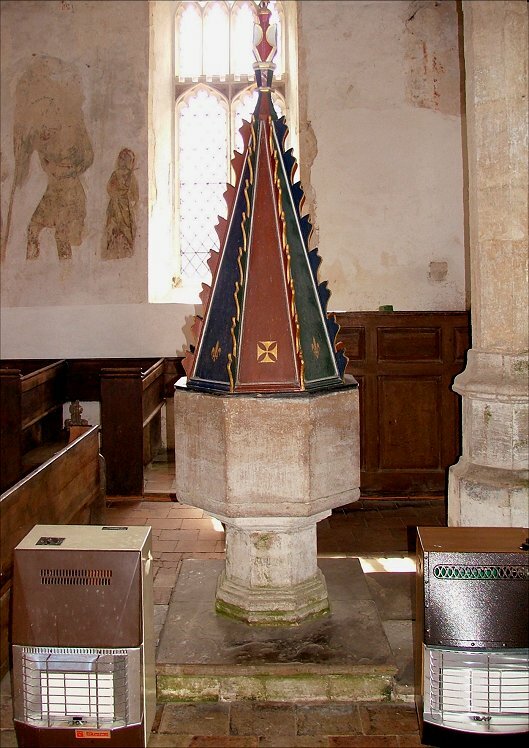 As at neighbouring Gateley the font is primitive and bulky, and topped off by a jaunty coloured cover. 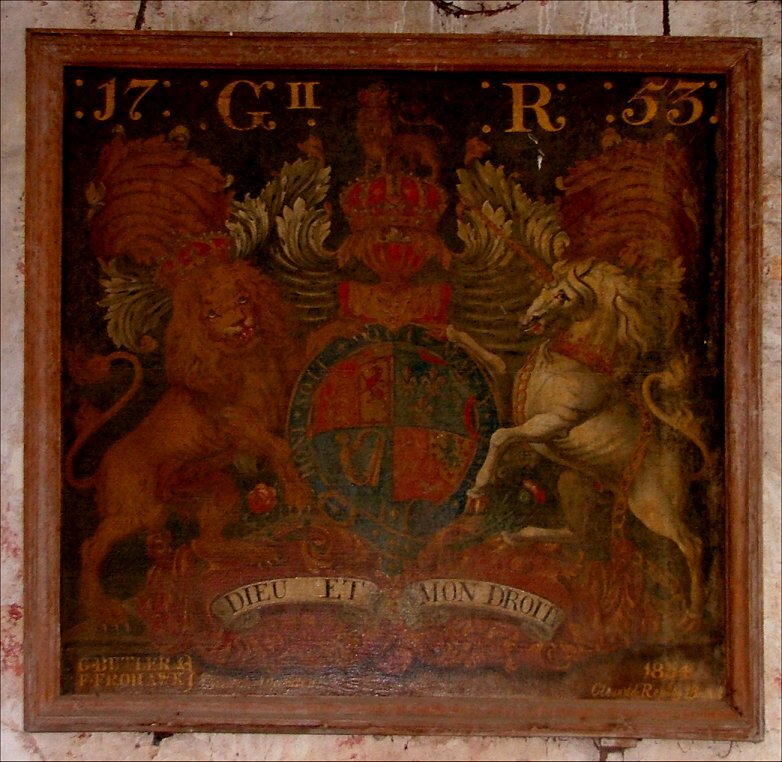 In 1753, the church put up its new George II royal arms. These are signed at the bottom by G Betler and F Frohawk, who cleaned and repaired them in 1854. 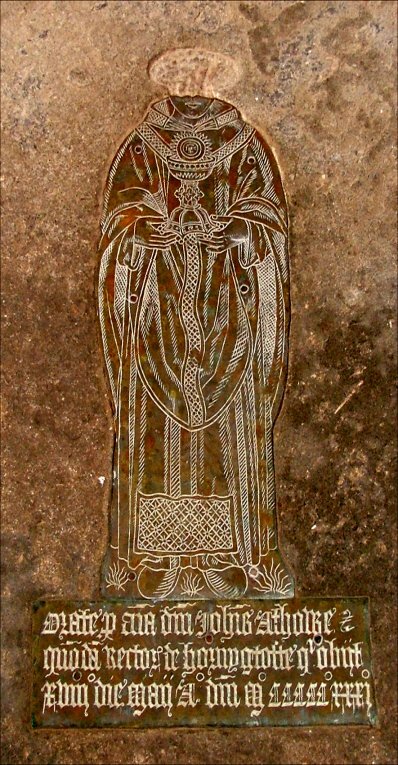 The famous brass is up in the chancel, depicting Priest John Athorne. 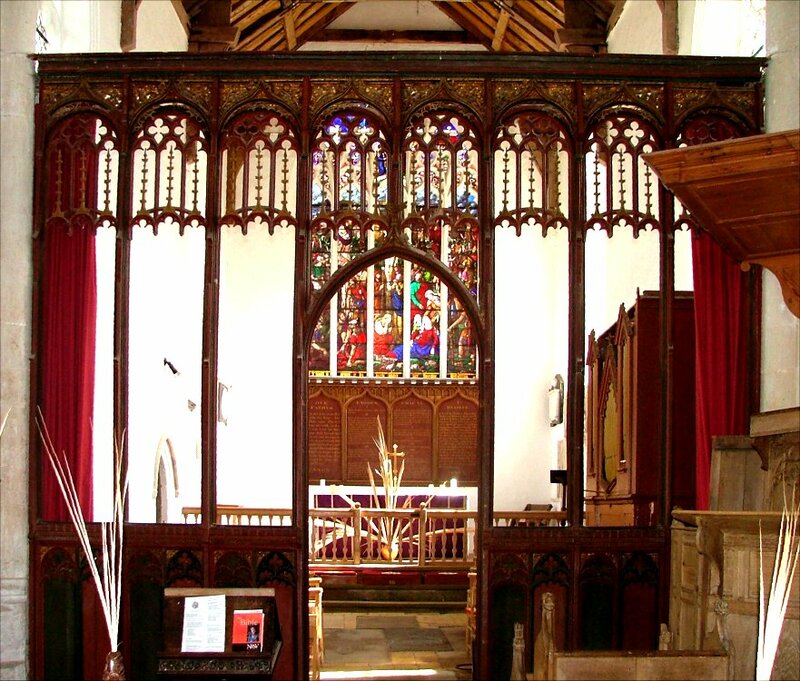 It is right on the very eve of the Reformation, 1531, and would be one of the last of its kind in England. 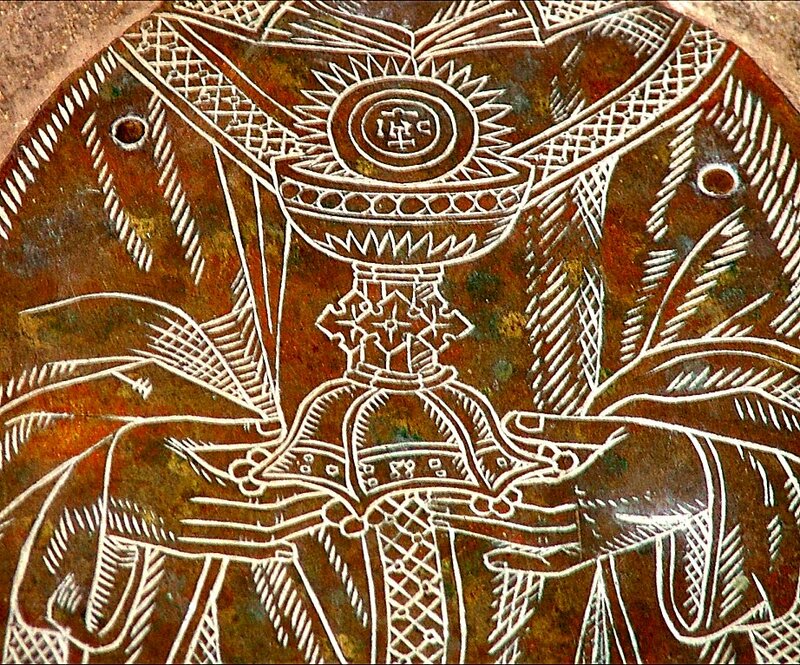 It shows him wearing Mass vestments and holding an ornate chalice with the host rising from it. 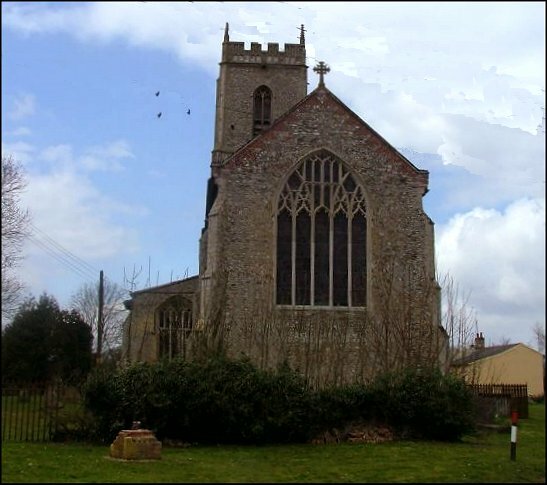 The inscription records that he was Rector of Horningtoft, a nearby parish. 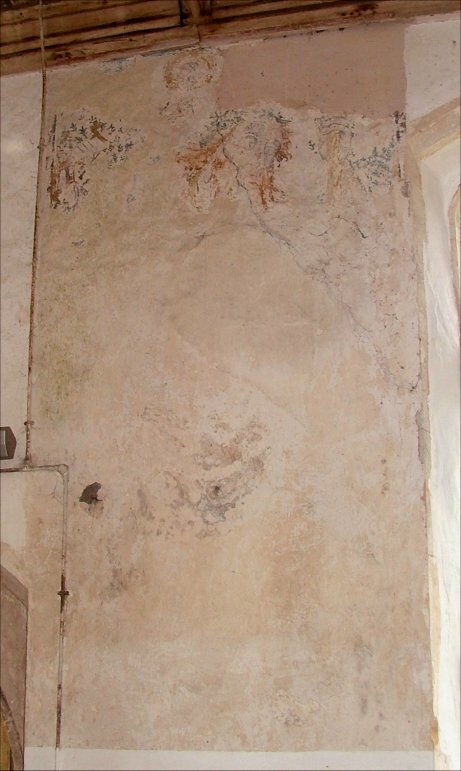 Athorne's inscription, which also asks for prayers for his soul, is in Latin, but another brass inscription in the nave has something similar in English. 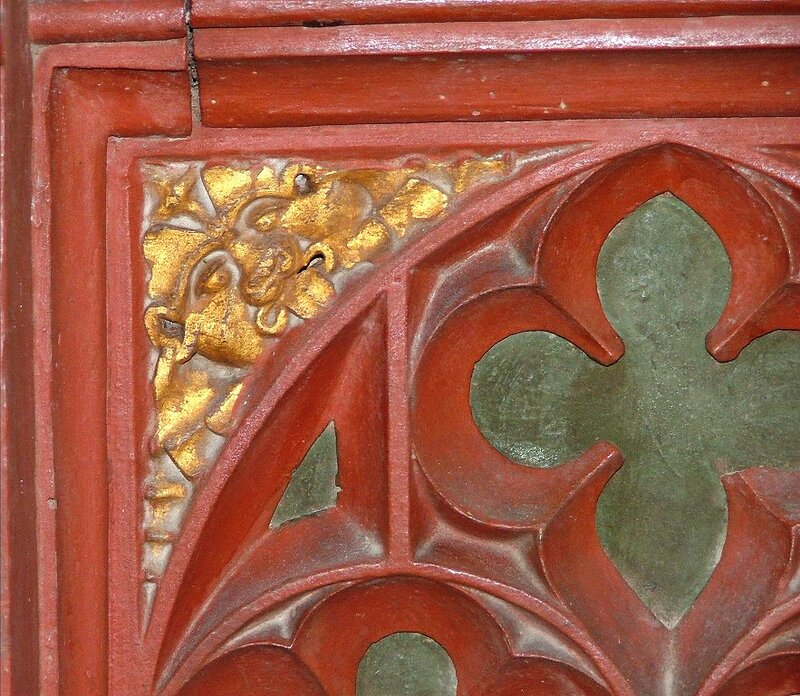 This is to Robert Markayte and Rose his wife, and dates from 1525. It is an unusual survival, and a haunting one, because it still contains both clauses that normally incurred the wrath of Anglican iconoclasts; Of your Charyte pray for the sowles of... it begins, and concludes on whose sowles Jsu have Mcy Amen. Another interesting inscription is on a ledger stone. P.M.S. 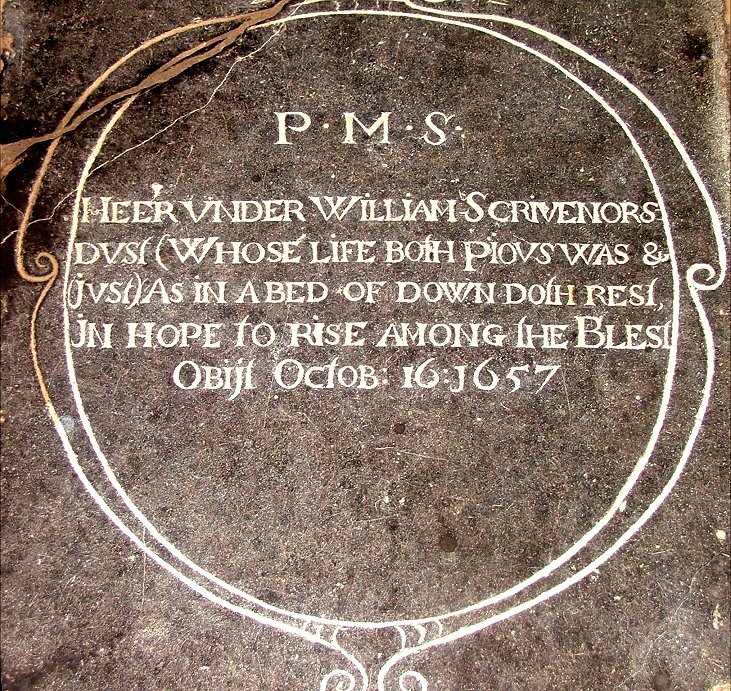 it begins, and then Heer under William Scrivenors dust (whose life both pious was and just) as in a bed of down doth rest in hope to rise among the blest - and that's all. Presumably, it was a member of Scrivenor's family, perhaps an infant. But we are not even told the name. 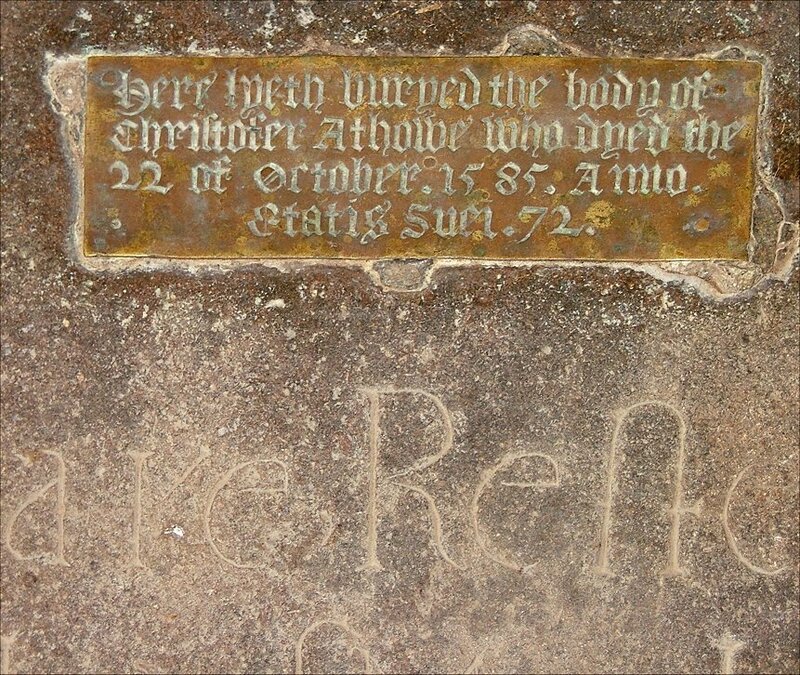 Nearby, there is another brass inscription, a very terse memorial: here lyeth buried the body of Christopher Athorne who dyed the 22 of October 1585, Anno Aetatis sum ('his age was') 72. 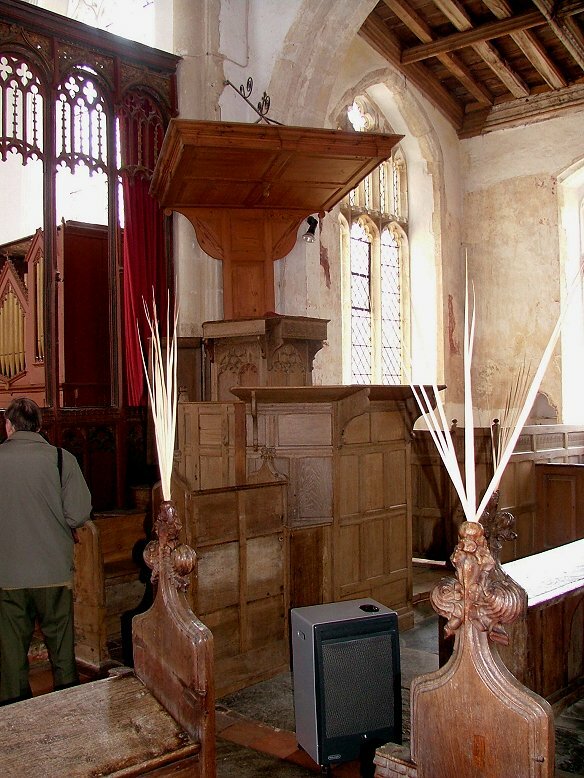 Athorne, of course, was the name of the Priest whose effigy appears up in the chancel. To have died age 72 in 1585 would have meant he was nephew or great-nephew of the old man, and probably just old enough to remember Catholic England - although his inscription reveals no shred of sympathy for it. 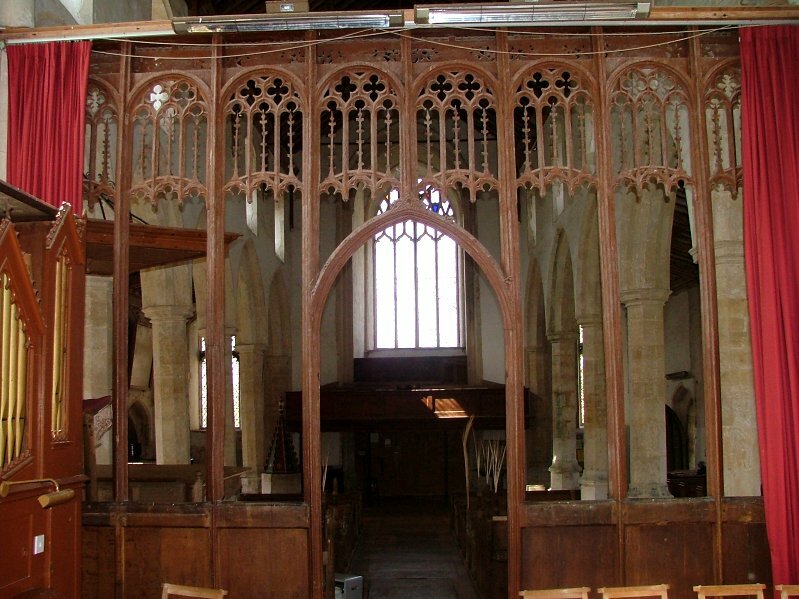 Perhaps the most memorable feature of St Bartholomew is to be found when you have stepped through the 15th century screen into the chancel. 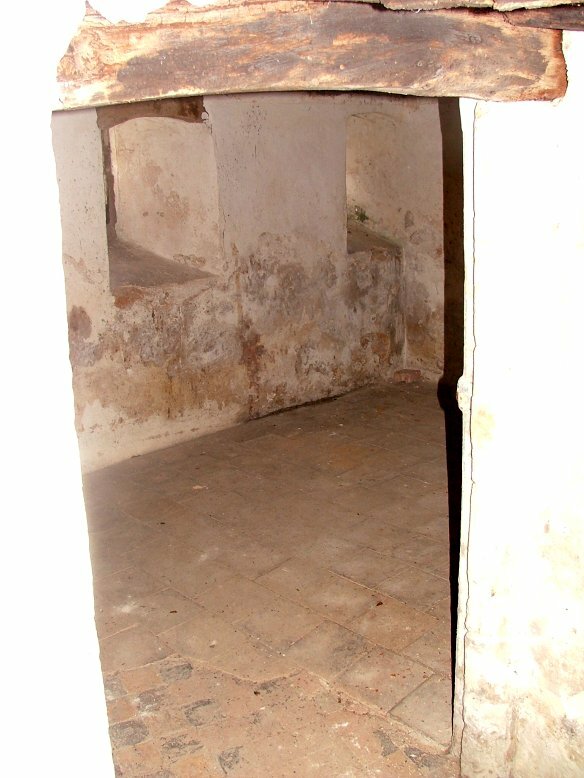 There is a doorway to the north which leads down into the crypt below the sanctuary. This is well worth a visit, and is usually open to the public. 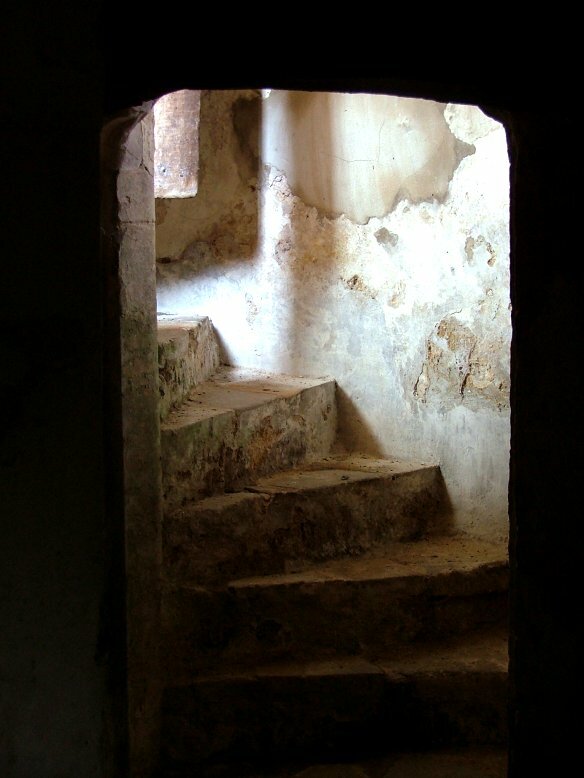 You climb down a narrow flight of stairs into a space which is curiously light and clean. I could imagine it as a wine cellar of some kind, perhaps. It is less easy to populate it in your mind with piles of coffins. 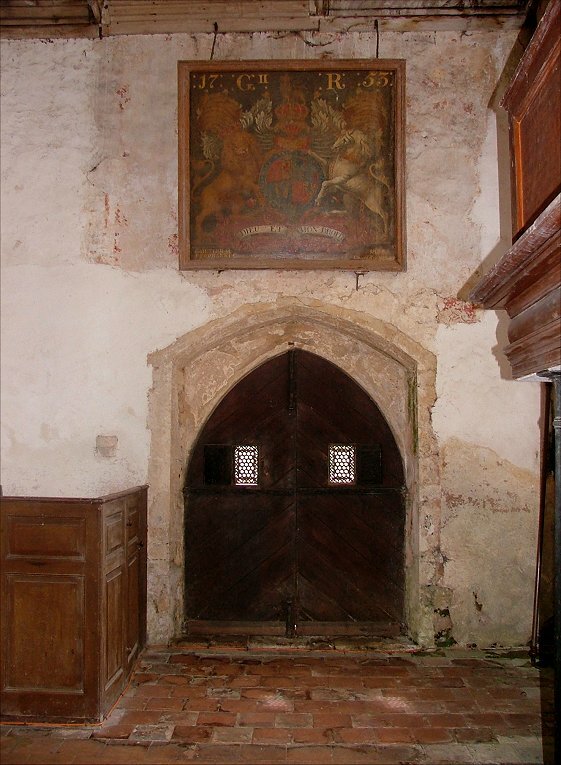 A notice on the wall tells you that it was once used to accomodate prisoners overnight on the long journey from Kings Lynn assizes to the gallows in Norwich. 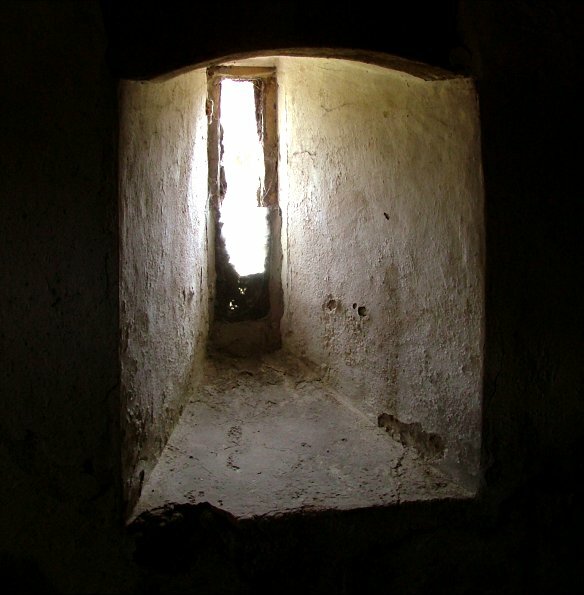 Imagine spending the night here with your execution in prospect for the day ahead! Not a happy thought.